I want to start by thanking you for the invitation to take part in your international symposium on global governance today and to congratulate you on the work you have done so far. Your themes are important, your document is purposeful, and you have accomplished a great deal already in your work together over the past year. Based on my experience, I would say you have been doing everything right up to now. It helps to get buy-in from all participants in the beginning. That can be accomplished by taking it slow, starting with regular seminars on work in progress to get to know one another, build up a shared vocabulary, an understanding of methodologies, a shared repertoire of key debates and elaboration of the concepts used to frame them and negotiate them, and a shared sense of over-arching goals. One of the challenges in this kind of team work is balancing individual goals with communal project goals. The work goes best when you can figure out how to get these aligned rather than working at cross purposes. My experience with collaborative, cross-disciplinary team research derives from several projects with overlapping goals in the general area of globalization and culture. I have been a team member, deputy director, and principal investigator on a range of interdisciplinary and international team projects and have been involved on adjudication committees for our national research funding agency. I will describe some of this work, with the aim of addressing my mandate for today’s talk: what works and what doesn’t. The answers vary depending on the nature of the team and its goals, but there is some general advice that helps in relation to the planning, management, outreach, and documentation of impact once specifics are accounted for. The balance across components will differ depending on the size of the group, its heterogeneity, its partnerships, and the nature of its goals (ie. Whether these are primarily academic, policy-oriented, agenda setting, problem-solving, partnership development, research creation). From 2001 to the present, I have served as deputy director of the SSHRC MCRI on “Globalization and Autonomy.” This was an ambitious 5 year project with a core budget of 2.5 million dollars involving roughly 40 co-investigators, 10 mostly international collaborators, many postdoctoral fellows and graduate students, an associated sub-team project on the two Mediterraneans run out of Tunisia, and an on-line Compendium run in partnership with associated funding in the digital humanities., Our core funding, which we extended a few years beyond the original termination date, has just run out. We have published 8 refereed volumes in the Globalization and Autonomy series with UBC Press, all in English and one also in French with Laval UP, and three of us are currently completing the co-authored capstone volume to the series, Globalization and Autonomy: Conversing Across Disciplines, reflecting back on what we learned. This project sought to advance understanding of the opportunities globalization creates and the constraints it places on individuals, communities, and nation-states as they seek to secure and build autonomy, which we defined as the right to govern oneself. The first four books are out in Chinese translation with China Academic Press and the rest are in process. As an outgrowth of that, I also participated in a smaller two-year project, “Building South-North Dialogue on Globalization Research,” with seed funding from 2007 to 2008. This project brought research on globalization from the Global South into more sustained dialogue with research from Canada and the Global North through two funded workshops, which led to an unsuccessful grant application for further work. Why was one successful and the other not? The answers are complex but I will try to itemize some of the factors that might seem relevant for your work here. First of all, Globalization and Autonomy was also unsuccessful in its first year, when we applied under the title, Globalization, Autonomy, and the Human Condition. It now seems astonishing to me we could have gone forward with such a broad title but we took it from the title of the centre directed by our PI and did not sufficiently think to differentiate the mandates of a centre for teaching and research based at a single university from the goals of a multi-university research project. Once we narrowed our focus, we found ourselves with a tighter and more manageable project. We made it to the short list that first year, which included an hour’s interview with an eight person multi-disciplinary committee. Their questions helped us to refine our thinking about what interdisciplinarity involved, why it mattered, and how it might be achieved. We really had not given these questions sufficient attention in our initial preparations. We had focussed most of our attention on our subject matter, particularly globalization, and had not thought nearly enough about the methodological challenges that come with any type of multidisciplinary, interdisciplinary, or transdisciplinary work, nor which kind of experimentation might work best for our project..
From this first failure, we learned several valuable lessons. Don’t give up. Our PI had not experienced failure before and was tempted to give up but the rest of us on the management team saw ways we could retool the application and rethink our project. Because we were not the leader, the defeat was less personal for us. Here team support was crucial. The PI has to pull it all together and bear the brunt of the responsibility, but there also has to a team with him or her to pull their weight. It has to be a team effort, from the beginning and all the way through. It’s a big commitment for everyone. So: Be clear about what you can contribute and how it will work for you. The senior members of our management team knew we wanted the challenge and could afford the risks. For the more junior members and the students especially, it was a riskier venture, given that silos still operate at many levels of assessment, and it’s still necessary to prove yourself in disciplinary terms and single-authored ventures, even if co-authorship and partnership work is also beginning to gain some credibility in some circles. In Canada, grant adjudication criteria are changing but other areas of adjudication, such as hiring, tenure and promotion, and publication criteria are not changing as quickly. Our team was committed to building a transgenerational network and we recognized the need to provide extra support and different kinds of training for the junior members of our team, to help them negotiate this transitional moment in globalizing forms of knowledge production and assessment. As the job market changes and university structures shift, the question of what kinds of training are needed requires more thought. The changing conditions of knowledge production and dissemination are a factor no current team project can ignore. For this reason I have recently joined a project just funded from Finland on “Ethical Internationalism in Higher Education in Times of Global Crises.” This is a postcolonial and decolonial project working to legitimate and integrate pluriversal modes of understanding into citizenship education and to balance an increasing focus on technical training with cultural and cross-cultural modes of performance. We have also been selected as a formal network within the World Education Research Association, an association of national educational associations. While most members of the team work in faculties of Education from around the world, some of us are in English, Gender, and Native Studies and Applied Linguistics. 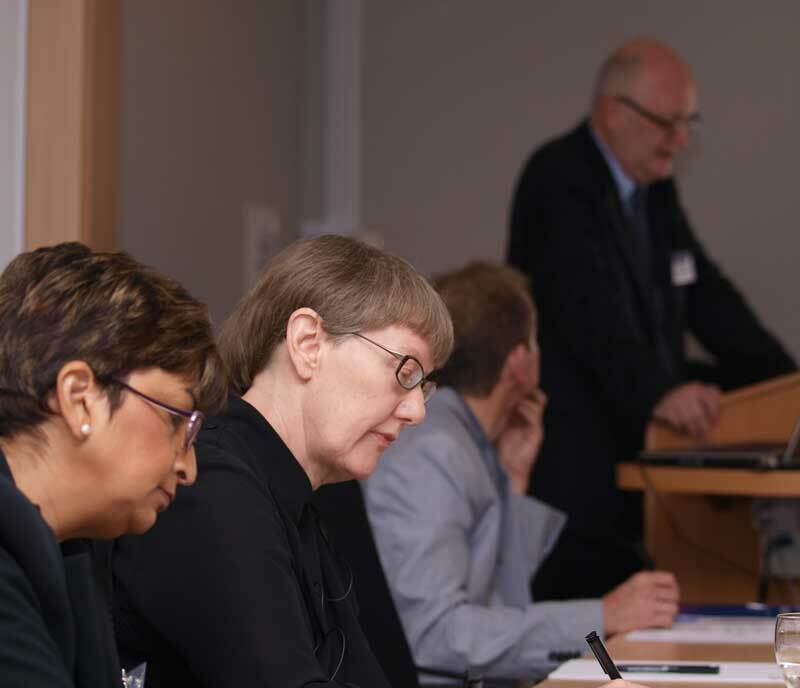 It is important to be clear about the degree of interdisciplinarity that is appropriate for your personnel and your project, and to consult the research on how to make interdisciplinarity work. Think carefully about the disciplinary expertise you will need on your team to reach your goals. Have some group discussions about these questions and perhaps run some trial interviews before applying, even if the grants you are going for do not include this component. How will people from other disciplines and places see your work? Anticipate their critiques and adjust for their advice. Think especially about what implications your choices will have for methodology as you do the research and writing and also for communicating within a range of publication venues and adjudication processes when you move toward publication. Recognize that different disciplines respond differently to interdisciplinary challenges and decide how much effort you need to make to include a range of perspectives. One of the more useful practices we developed was to share individually-produced work in progress through a process that involved circulating the draft to the appropriate sub-group in advance, and assigning two people from disciplines different to the author to present the draft to the group, commenting on how they saw its argument, method, relation to our project, and contribution it was making to our goals. We did this with every chapter in our Communities volume, sometimes two or three times for three years running, and it really helped us see where we needed to work harder to define our terms, refine our theoretical frameworks, and communicate our meanings to audiences beyond those we normally addressed within our specialized epistemic communities of readers. Each volume made different methodological and rhetorical choices in communicating its results, so that some volumes remained deliberately diverse and others created a more integrated impression. Some ended with conclusions or epilogues and some had no formal concluding chapter. What we found in Globalization and Autonomy, a lesson reinforced in Building Global Democracy, was that sometimes each discipline may use a particular term in a distinctive way, not quite realizing that other disciplines understand the same term somewhat differently. When one is working transnationally, these misunderstandings can be compounded by different histories and political experiences, making it even more crucial to sort these out. The South/North dialogue project never fully came to terms with these challenges—in part because we lacked the time to develop an understanding of how important they were but also because the team was never able to draw convincing connections between the disparate interests of its members. I learned from that experience in designing my recently funded project, Brazil/Canada Knowledge Exchange: developing transnational literacies. In this project, we focus directly on how to understand situated forms of meaning-making and the alternative understandings they generate. This is a partnership development project linking a few university-based research projects, professors, teachers and teachers-in-training in different parts of Brazil and Canada, with the aim of helping teachers of English develop strategies for promoting critical, transregional, and transnational literacies in their classrooms and research production. It is designed for Brazilians and Canadians to learn from each other and with each other as well as about each other. We are still figuring out how to advance these various goals together. We are generating some great workshops for teachers and students and some exciting interactions when we meet in person but it remains difficult to generate the intensive interdisciplinary dialogues we need and facilitate regular exchanges on an ongoing basis, sharing work in progress and co-producing work. Despite the virtual connections now enabled by new technologies, face to face interactions in a dedicated time period still work best for multi-sited teams. There are also many cultural differences to negotiate and deeply engrained assumptions to challenge—within both countries.. These challenges are what make the work valuable and it’s almost always fun. When you are dealing with issues that matter to people, the interactions become deeply rewarding. You have an advantage in sharing a location. Being in the same place also has its drawbacks: it is hard to carve out time for research development but you have shown it can be done. The challenge will be to maintain your momentum and take it forward from sharing to production. What worked for one of my writing groups in an earlier period was to designate a reserved time, one or two hours once every two weeks or once a month, in which we agree to meet, on campus, with a rotating system of assigned responsibility for generating the content for discussion. We set clear rules forbidding any discussion not immediately relevant to the research under discussion. With that dedicated focus, we could keep our focus, advance our work, and ensure productivity. But that only works for relatively small groups. As a literary scholar with a background in postcolonial cultural studies, I am interested in the frameworks a group sets itself, the vocabulary it employs, and the assumptions embedded in these. As some of you note in your document, naming is not neutral. I could talk at more length about the insights provided from colleagues in other parts of the world into the ideological implications they saw in terms that to me seemed initially neutral or even positive. Once you have framed your own group synergies, it will be time for you to consider interacting with colleagues on a global scale. At that point you may find, as we did with Globalization and Autonomy, that initial framings need to be rethought and questions rephrased to address a range of new perspectives. We had what to our PI seemed a mini-team rebellion at our first full team meeting as the group took full ownership of the project by revising its methodology and refining its goals. It was the flexibility and openness to criticism of our PI and management team that enabled us to strengthen the project and the group spirit through this experience that could have been a failure. Our PI still wishes he could have anticipated and corrected for this but it is this kind of surprise that team work will often throw up for us if it is going well. Your document testifies to the strength of your analysis and your commitment. I look forward to discussing its details and their implications with you throughout the rest of the day.